Das Programm ändert sich die MAC-Adresse Ihres Bluetooth-Adapter. Das Programm ändert sich die MAC-Adresse Ihres Bluetooth-Adapter. Unterstützte CSR und Broadcom-Chip Bluetooth-Adapter. Sowohl tragbar und Setup-Versionen erhältlich. 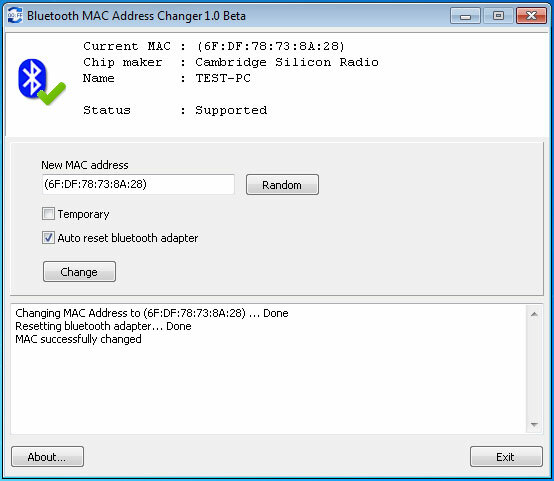 Bluetooth MAC Address Changer 1.4 January 15, 2017 2015 MACAddressChanger.com info@macaddresschanger.com LICENSE AGREEMENT By installing and using Bluetooth MAC Address Changer ("Software Product"), you agree to be bound by the terms of this agreement. If you do not agree to the terms of this agreement, do not install or use this Software Product and delete any copies of the Software Product that you have downloaded.